Ballroom Dancing exercise programs will help you to Prevent Falls. Ballroom Dancing involves synchronised and isolated movements, both with and without a partner to the beat of the music. Timing is critical to any dance, either in a synchronised movement with other dancers or to the beat of music. Dancing involves the movement of one or multiple bodies in a synchronised manner with or without music. Co-ordination is when our arms and legs work together in a purposeful way, this allows us to complete specific movements. Co-ordination is needed to do everyday things like hitting a golf or tennis ball or stepping over objects in your way. Ballroom Dancing involves using large muscles for movement and core muscles for balance. The type of movements required varies by the type of dance being completed, however dancing may involve supporting another person’s weight, performing floor work and conducting explosive movements such as leaps and jumps, all of which require strength. Strength training is when we do exercises against resistance, perhaps a leg weight, resistance band or just using our own body weight. Strong muscles help protect our joints and bones, do daily tasks more efficiently and also protect us from injury. As we get older our muscles naturally lose some of their size and bulk, doing exercise to strengthen muscles 2-3 times a week, as well as gradually increasing the resistance, can help slow this process down. Ballroom Dancing develops core muscle awareness and strength which promote good posture. Dance can require the individual to perform different unilateral stances and movement of the body’s line of gravity outside its base of support. Studies have found better balance levels in dancers compared to non-dancers. Balance is our ability to stay upright when standing still and in control during movements. Balance is a complex process involving your nervous and sensory systems, as well as our muscles and joints. It occurs unconsciously and helps us with activities, like walking and going down stairs. We can improve balance with thirty minutes of physical activity that challenges balance each day. Dancing requires stopping, starting and changing direction quickly while being aware of a routine and position of your partner. Being agile allows us to stop, start and change direction. This is important to avoid an obstacle in our path or catch ourselves if we trip. Exercises that focus on balance, mobility and coordination can improve our agility. Dancers require flexibility, particularly hip and ankle flexibility, to perform continuous and strenuous movements with their legs. Muscle and joint flexibility allows the dancer to complete movements with minimal anatomical and muscular limitations. Flexibility is when our muscles can easily stretch and our joints move well. This allows us to move, turn and bend, as well as stretch to reach things when we need them. The less we move around the less flexible we become, so moving our joints and big muscles through their full movement twice a week will help us stay flexible to prevent injuries. Routines are often involved in dancing, with the dancer utilising their brain to memorise the different components of the routine and in some cases to work in synchronise with a partner or group. Dancing can also be a very social activity, with the dancer using their cognition to interact with fellow dancers. Dancing requires the individual to generate, execute and coordinate complex movement patterns which requires the integration of physical and cognitive skills. Cognition is about how our brain receives and uses information. Staying active and upright uses different parts of our thinking and memory. The way our brain receives and uses info can be affected by a variety of health issues such as dementia. 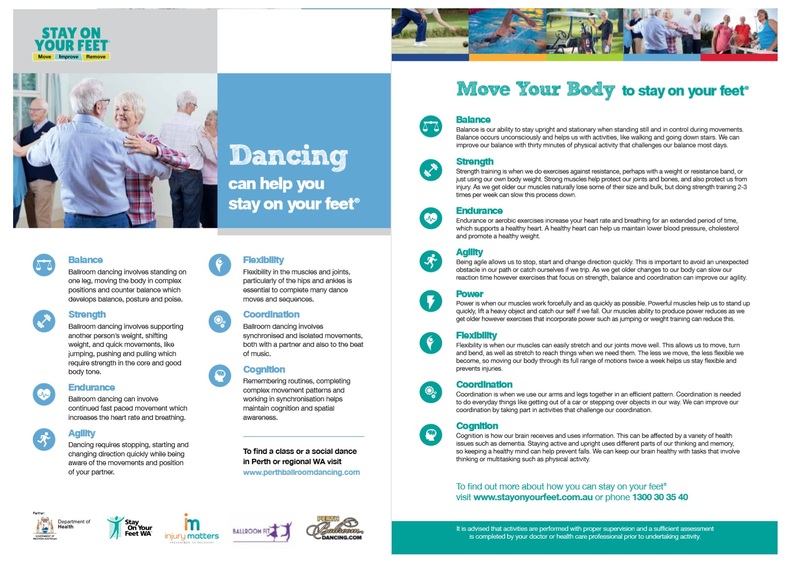 By doing activities that keep an active body and mind, we can improve our cognition and stay strong to prevent falls. Power is when muscles work forcefully and as quickly as possible. Powerful muscles allow us to react and move quickly when we slip, trip or need to shift our bodies and heavy objects. Having strong and powerful muscles can help us stay active, independent and safe on our feet. Dancers continuously performing different movements throughout the routine requires maintenance of muscular strength over time.